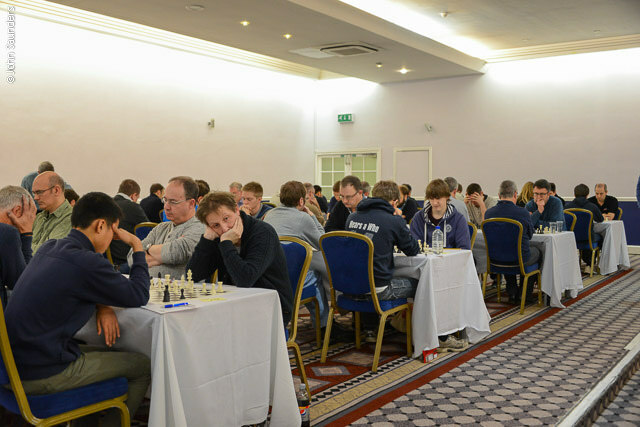 The 22nd season of the 4NCL (British Team League) got underway on 15 November 2014. Running one’s eye down the squads for this season, it rather looks as if Guildford are the stand-out favourites to win their third successive title, and their sixth in total (which, if achieved, would equal Wood Green’s tally of championships). Once again the Surrey team enjoy the generous patronage of Roger Emerson, whom readers of these reports will recall twirling his samurai sword at a team pep talk before last year’s decider. The sword, I should add, had a blunt edge and was just for show, but his team the next day was razor-sharp: Guildford beat Wood Green HK by 6-2. To find the last time Guildford’s first team didn’t win a match you have to go back to the final match of the 2012/13 season when a 4-4 draw with the same team was still good enough to win them the title. I suppose the simplest way to assess a squad’s potential strength would be to play a quick game of ‘count the grandmaster’. Guildford’s GM count is 11, and most of them were present for the first round of matches (six in the first team and two in the second). Wood Green HK (who field just the one team) have eight but only two of them played at this weekend. Cheddleton have a healthy six. Barbican, White Rose and Blackthorne Russia have two each, and e2e4.org.co.uk one. 3Cs also have one GM but they currently languish in the second division. So, on the face of it, Cheddleton look to be the nearest thing Guildford 1 have to rivals for the championship (with the possible exception of the Surrey club’s own second team). 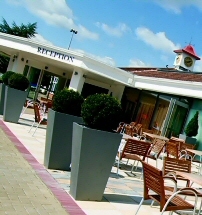 Guildford 1 and Cheddleton are both in the same preliminary group and are fated to meet in the sixth round in February. But enough of looking into the future: let’s see how the teams performed in their November matches. Wood Green HK, with their reduced patronage, were some way short of their traditional strength against Warwickshire Select, newly promoted from Division 2. The Midlands side fully capitalised on the boards lacking titled players at the lower end of the Wood Green team but this wasn’t enough to make up for some hefty disparities in strength higher up the board order. 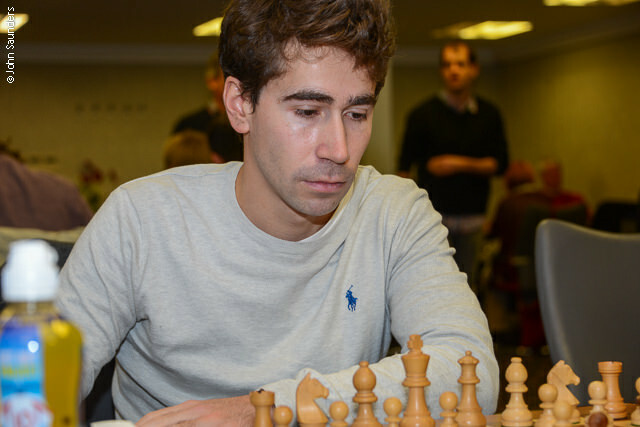 Jon Speelman got his 4NCL season off to a good start against Geoff Lawton. 25.Re6! A familiar exchange sacrifice, cutting Black’s position in half and ramping up the pressure on the f5–pawn. 25...Bxe6 26.dxe6 Rf6 27.Nh5 Necessary precision: it would be all too easy for we lesser mortals to proceed with something like 27.Bxf5?! 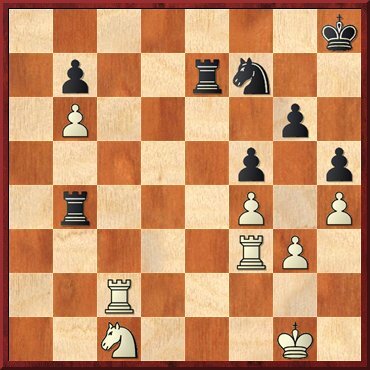 Rb8 when Black can generate a bit of queenside counterplay with ...b7–b5, and it would be hard to move the bishop from f5 because of the weak f4–pawn. 27...Kh8 28.g3 Qg8 29.Nxf6 Bxf6 30.Bxf5 Qg7 31.Re2 Rg8 32.Rg2 Bd4 33.Qe2 Qf6 34.Bd3 Rb8 35.Qe4 1-0 I suppose Black could soldier on with 35...Qg7 36.b3 but the white kingside pawns soon roll forward and the long-term prospect of an opposite-coloured bishop endgame is just a pipe-dream. The ADs, with an average rating of 2187, could be in for some relegation problems this season unless they strengthen their squad, and they were well beaten by Barbican 1. Incidentally, though the team’s abbreviated moniker stands for ‘The Antediluvians’, the club follows the refreshing 4NCL tradition for disregarding the team name completely. Just as Barbican Youth has been known to field pensioners, The ADs sport teenagers in their team. 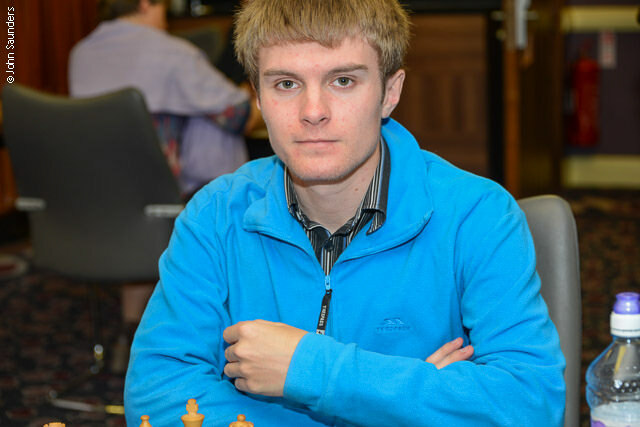 A pretty good one, too: 17-year-old Alan Merry recently achieved a remarkable GM norm in the PokerStars Isle of Man International, even before qualifying as an IM, but he was brought back to earth in Hinckley by Irish IM Sam Collins, who played some forceful, imaginative chess. Guildford 2 and Blackthorne Russia were quite well matched but it was the slightly higher-rated Guildford team which triumphed, to the tune of 5-3. 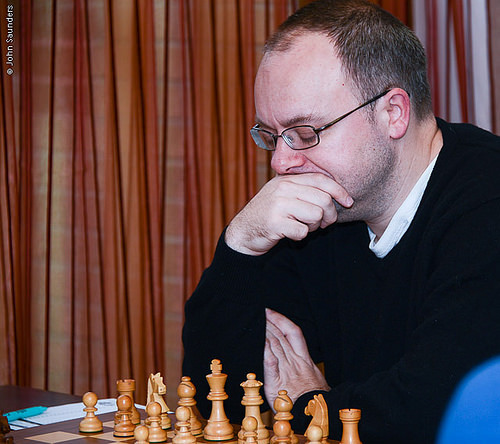 Dave Smerdon returned to the scene of his recent 4NCL Rapidplay Individual success and won again, beating Danny Gormally in a c3 Sicilian. 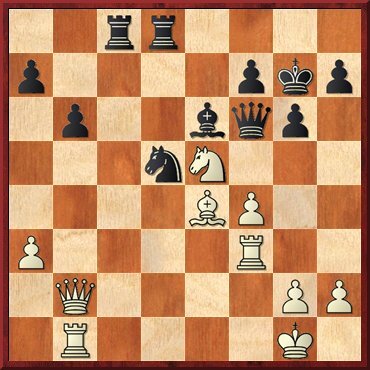 It was another case of someone castling into trouble but White needed to see quite a long and tricky tactical sequence to figure out why his position was so good. South Wales Dragons, my own former team, have done well to win promotion from Division Two but they have a tough season ahead of them. They took a 2-6 beating from White Rose but at least John Cooper had a good day, beating GM Colin McNab. I would annotate the game but I’d probably get accused of favouritism towards the Land of my Fathers – in fact, the real reason is that I’m half-Scots and didn’t enjoy someone from the Land of my Mothers get so horribly mangled on the White side of an English Opening (he would have had to find another opening if the referendum had gone the other way). Defeat might have been heavier for the Dragons but for James Cobb managing to grab a perpetual check in a position where Peter Wells’s passed pawns were threatening to push him off the board. Guildford 1 got underway with a comfortable 6½-1½ win against Hackney. Curiously, both teams had a player called Suárez in the side but they didn’t play each other. Had they done so, it might have been a case of the biter bit. But actually both lost a rather toothless encounter. Sorry... that was a purely gratuitous bite-joke, actually they (Carlos Suárez García and Alberto Suárez Real, that is) were the victims of some deftly applied pressure from Matthew Sadler and Rubén Cenal Gutiérrez respectively. 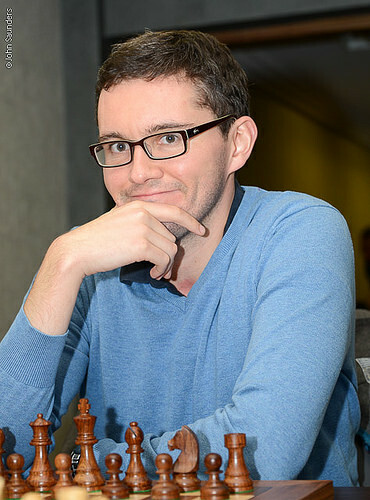 Bob Eames did well to hold French super-GM Romain Edouard, rated more than 400 points above him. 34.Ra5? 34.Ra7 Nxd5 35.exd5 Rcd8 36.Rfa1 Kc8 37.Rc1+ forces 37...Kd7 38.Rxb7+ Kd6 39.Rbc7 and White should win. 34...Rcd8?? 34...Nxd5! 35.exd5 Rcd8! and White doesn’t have anything very convincing, e.g. 36.Rfa1 Kc8 37.Ra7 f5 38.Rc1+ Kb8 39.Rc7 Rxd5 40.Rcxb7+ Kc8 41.Rg7 Kb8 42.Rxg6 Rd1+ 43.Kh2 Rd2 44.Rxg5 f4, etc. 35.Ne7! 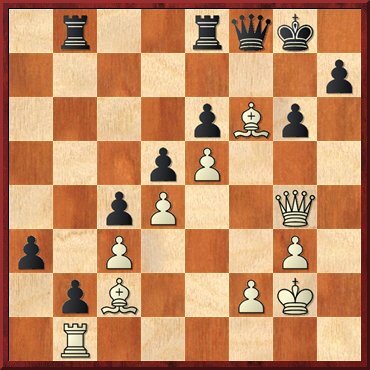 1-0 Black cannot avoid mate or heavy material loss: 35...Rd6 36.Rfa1 Rxb6 37.Ra8+ Kc7 38.Rxf8, etc. This was not the only frustration for the e2e4.org.uk of the afternoon, with a couple of other results going against them in time pressure or the endgame. This one came to a gruesome finale. Barbican 2 versus Grantham Sharks was a close match in which four lower-rated players overcame higher-rated opposition, with Grantham winning with a better score on the lower boards. Isaac Sanders soon had Thomas Rendle in a terrible tangle. Graham Morrison gave Holger Grund an even bigger sharracking on the second board but thereafter the Sharks were in the ascendant, winning 5-3. Barbican 2 were a bit unfortunate. 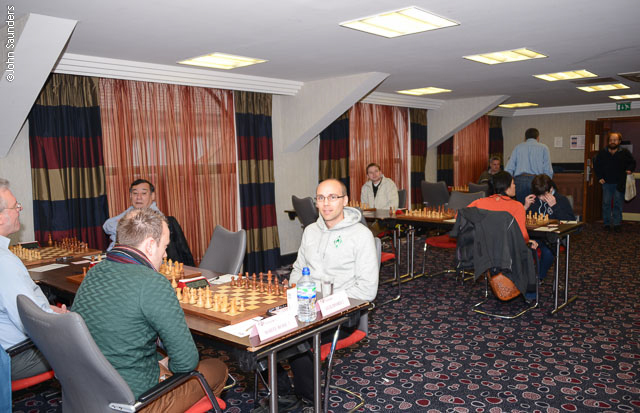 Their captain Jonathan Rogers had a particularly bleak afternoon, playing what can only be described as a self-cheapo – practically forcing his opponent to find a move winning a piece. 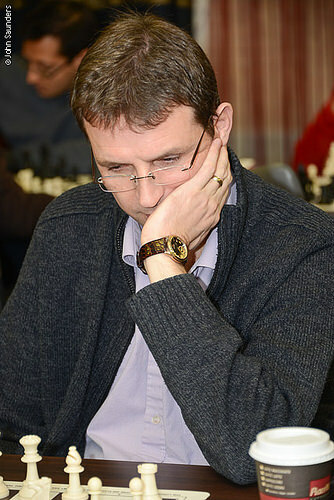 David Coleman lost after missing a fleeting chance at a brilliant win. But he shouldn’t beat himself over it – this one looks to be “engines only”. Cheddleton versus Oxford was an entertaining match, won 4½-3½ by the Staffordshire villagers. (In name only, of course, in keeping with the aforementioned 4NCL tradition: a great pity they don’t name themselves after the nearby town of Leek as I’m sure I could have much more wordplay fun with that name.) 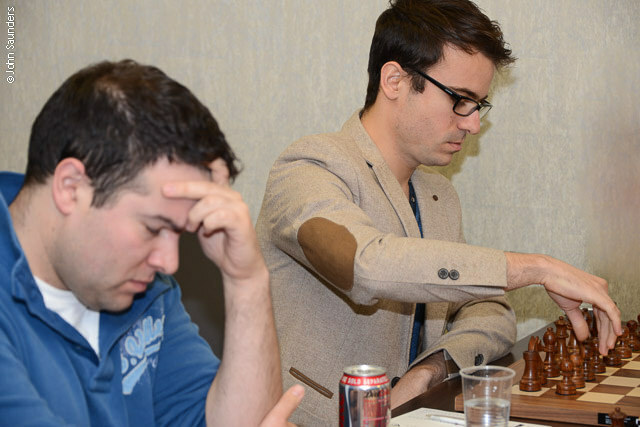 David Howell won a frantic finish against Justin Tan, while soon-to-be-confirmed GM Jonathan Hawkins won in more sedate fashion. I particularly enjoyed some of the nuances of Keith Arkell’s game, which I discussed with him later on Facebook (with the benefit of Houdini on my part). 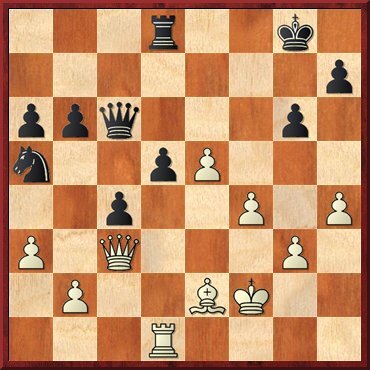 If you are skim-reading this report and only have time to look at one chess position, do have a look at the remarkable zugzwang that might have occurred in the variation starting 35...Nc6 – it’s a cracker. Tom Eckersley-Waites and Marcus Harvey had two very creditable wins for Oxford on the middle boards, against David Eggleston and Simon Williams respectively, but it wasn’t enough to change the destination of the match points. The Ginger GM played an interesting new idea in the Queen’s Indian and seemed to be doing well but his attempt to finish with a sacrificial flourish backfired. I won’t annotate the game but it’s worth playing through from the download. Where things really fell apart for Oxford was on board six, where Neil Dickenson seemed to be winning but inexplicably subsided into an endgame disaster. This report seems to be getting inordinately long, perhaps because the Saturday games struck me as so entertaining. Rather more so, it strikes me, than the rarefied games played in world championships and super-tournaments. Not a tedious Berlin Defence in sight, thankfully. But now forward to Sunday: Division 1a featured three very tight matches which may have a significant bearing on the teams to qualify for the Championship pool and those who will have to play their games in the departure lounge (a.k.a. the Relegation Pool) later on in the season. Barbican 1 and Wood Green have had a good many close matches over the years but at this moment in time Barbican 1 have slightly the stronger squad, albeit with only the one GM to Wood Green’s two. 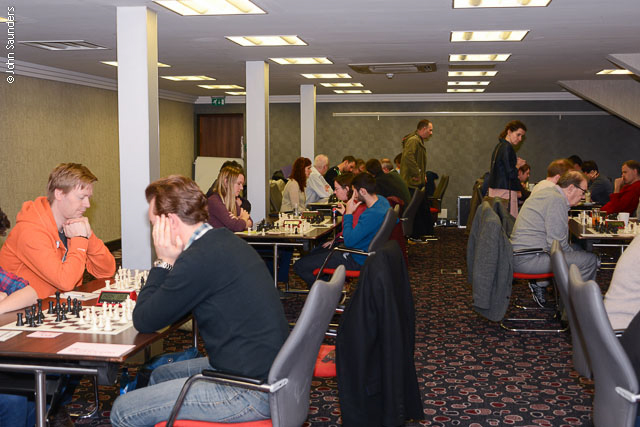 There were just three decisive results, with two female players, Jovanka Houska and Kanwal Bhatia supplying full points for their respective teams, and Lorin D’Costa beating Scottish GM John Shaw to give Barbican 1 the points. John Shaw gave up a couple of pawns for an initiative on the black side of an English opening but never got quite enough for it. White Rose versus Guildford 2 was another tight match, with the Yorkshire side winning by the minimum margin. The heavyweight battles on the higher boards were hard fought but drawn, so the lower boards were left to produce decisive results. 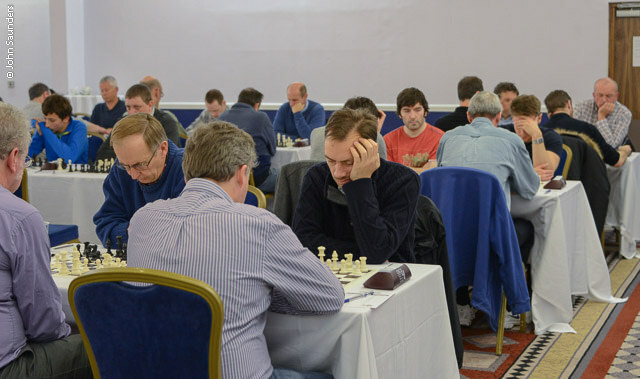 Nigel Povah won for Guildford on bottom board, but James Adair and Iain Gourlay replied in kind for White Rose. 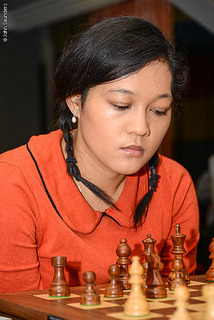 Guildford 2’s hopes of a match point were dashed when Sophie Milliet lost on time against James Adair, one move short of the time control, while a fraught game between Colin McNab and Yang Fan-Zhou might have gone either way before ending as a draw. Warwickshire Select had a tough time on the top boards against The ADs, with Geoff Lawton opening with the uninspiring 1.e4 d5 2.d3 and being ground down, and Don Mason being given Merry hell in a tactical mêlée on board two. To be fair, the loser deserves equal billing with the winner for his part in this hugely entertaining game, kicking off a spirited and imaginative counter with 17...e5! which so nearly saved him. 17...e5! 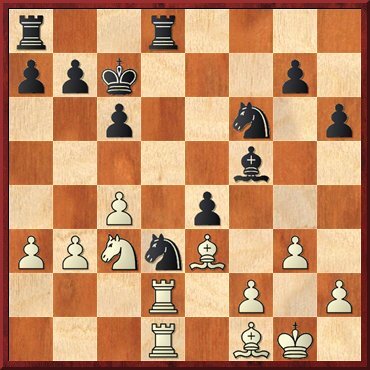 Black, in big trouble, tries to stir up a tactical mess and, although it’s objectively unsound, it’s a highly imaginative practical try since 17...Rf3 18.Qh8+ Kd7 19.Qf6! e5 20.Qxf7 looks as though it would lose without much of a fight. 18.Qh8+ Here Houdini sees about a gazillion moves ahead and finds 18.Bxe7!, which wins for reasons which only become apparent in a few moves’ time. For the time being, let’s just enjoy some human chess... 18...Kd7 19.Nxh3 Has Black simply hung a rook? No, he’s still in the game... 19...Kc7! Black has a mega-threat: Bxh3+ followed by Rxh8. Despite White’s big material advantage, it’s not so easy to find a way to capitalise. 20.Rg2! 20.Qf6 Bxh3+ 21.Ke2 Be6 gives Black a reasonable chance of survival, though the h5–pawn is a worry. 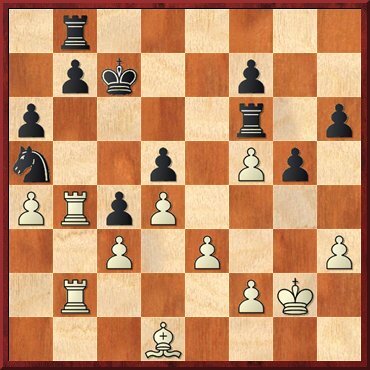 20...Bxh3 An ingenious double rook sacrifice but Houdini comes up with a more refined version of this - 20...f6! 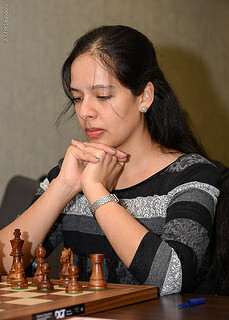 - and good moves for White are hard to find (particularly if you’re not equipped with a dual core brain). Maybe 21.Be3!? 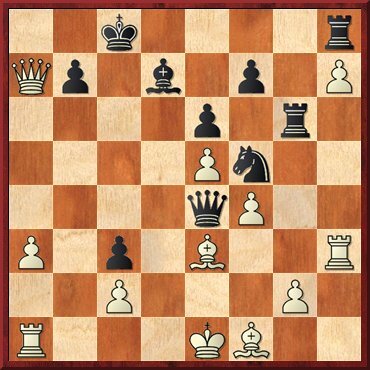 when Houdini adjudges White to be a bit better after 21...Bxh3 22.Qxa8 e4, etc. 21.Qxa8 e4 21...f6! is still good, though now White has 22.Qh8 fxg5 23.hxg5 Bxg2+ 24.Kxg2 and is a fair bit better. Now White has a couple of precise moves to find. 22.Bxe7! 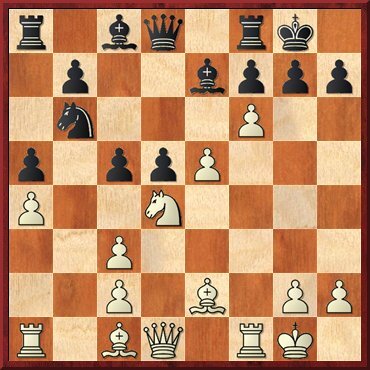 Qh2 Not 22...Nxe7 as White switches focus with 23.Rb1! and Black never gets the chance to deploy his counterplay with Qh2. 23.Bxe4! 23.Qg8? 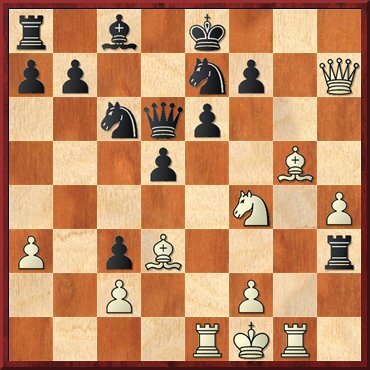 comes close to winning as well but there is a sting in the tail: 23...Qh1+ 24.Ke2 exd3+ 25.cxd3 Nd4+! 26.Ke3 Qxe1+ 27.Kxd4 Qxe7 28.Qg3+ Kc6 29.Qxh3 Qc5+ and it’s perpetual. 23...dxe4 24.Qg8! South Wales Dragons succumbed 1½-6½ to Blackthorne Russia, losing on the top five boards in various different ways. James Cobb seemed to forget the en passant rule at a critical juncture. 30.b4 Nb3?? Hard to understand. 30...cxb3 31.Qxc6 Nxc6 32.Rb1 Nd4 33.Bd1 Rc8 34.Bxb3 Rc5 gives Black a perfectly reasonable chance of drawing. Black must have perpetrated a major miscalculation of the following tactics. 31.Bxc4! Creating two pins (along the file and diagonal) for the price of a self-pin (along the c-file). It also threatens to unpin immediately with Bd5+ so Black has to move his king off the a2–g8 diagonal. 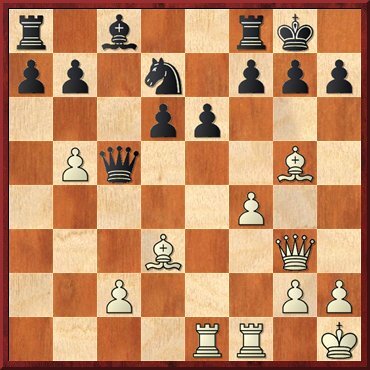 31...Kg7 Unfortunately for Black, 31...Kf8 is ruled out because of the simple 32.Qxb3 dxc4 33.Rxd8+ Ke7 34.Qd1, etc. At least now the knight is indirectly defended but the black king is not yet safe from checks. 32.e6+ Kh6 33.f5 Rf8 A glimmer of counterplay down the f-file? 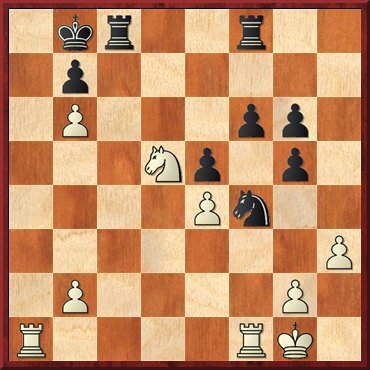 Perhaps this is where Black’s calculations went wrong as White has a decisive pair of intermezzo moves. 34.Qe3+ 1-0 34...Kg7 35.Qe5+ Rf6 36.Bxb3 is one winning line. Guildford 1 were untroubled by e2e4.org.uk, winning five games and drawing three. Board three featured a French GM and, appropriately enough, a moment of déjà vu for his English opponent. Do the French also say “un moment senior”... ? Grantham Sharks versus Cheddleton was a pretty close run thing, with the latter just getting home by the odd point. What nearly scuppered their chances was an uncharacteristic endgame loss by Keith Arkell on board five against 18-year-old Peter Batchelor. A half match point went begging on board seven when White missed a fleeting chance to win the game. The sort of soul-destroying tactic the computer shows you when you key your game in when you get home after a match. The game went 39.Rc6? Rxc6 40.dxc6 Nf6 41.Qa6 Qe6 42.Qxa5 b3 and a draw was agreed on move 65. What White missed was 39.Rxc7! Rxc7 40.Rc6!! 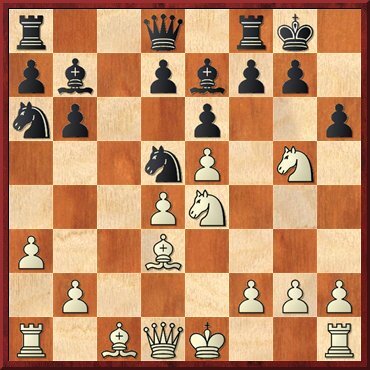 is decisive: 40...Rxc6 41.dxc6 Nf6 (or 41...Nf8 42.Qd5+! Qxd5 43.exd5 and a pawn queens) 42.Qc4+! Kh8 43.c7 wins. Only now do I notice... I made all those existentialist word plays around Guillaume Camus’s name in the round one section of the report and completely overlooked the fact that his team’s board one was called John-Paul. An open goal and I missed it. Oh well, I’ll leave you to make up your own jokes this time and stick to the chess. Cambridge University brought off a handsome win against Hackney thanks to three decisive wins and no losses. However, at least one of the wins might have gone the other way but for a diabolical trick. 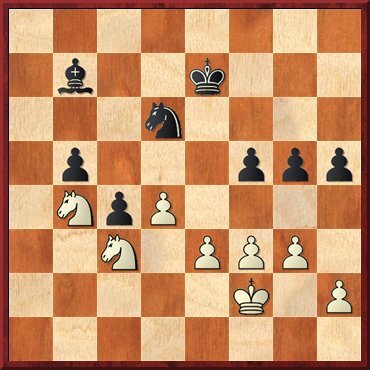 White has three extra pawns but things start going wrong very quickly. 42.Qb4? Giving back one pawn with 42.d4!? 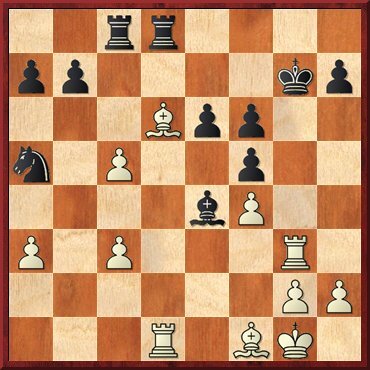 exd4 to be able to secure the f2–pawn with 43.Nd3 is one prudent line. 42...Rhf6! 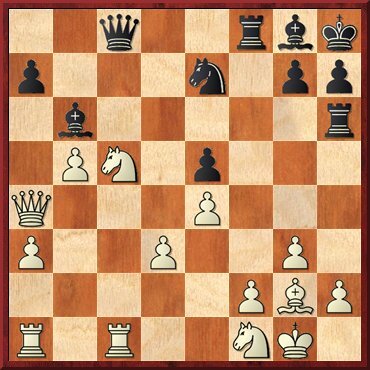 43.d4 There is no good way to defend the f2–pawn as 43.f3 allows tricks such as 43...Nc6!? 44.bxc6 Rxc6, regaining some material and reaching a probably drawn position. 43...Rxf2 44.Nd3 Simultaneously attacking the queen and the rook, but Black has a useful counter. 44...Rxg2+!? 45.Kxg2 Qg4! 46.Nc5?? 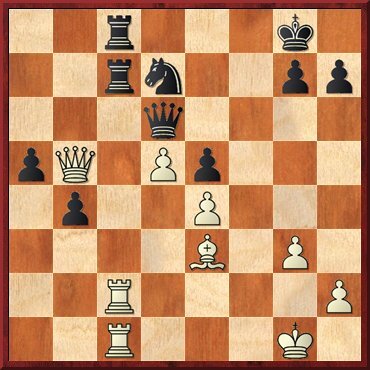 46.Qxe7 allows a draw with 46...Qf3+ 47.Kh3 Qh5+, etc, but if White but knew it, it is in fact the only line not to lose. He thinks he only has to worry about the black queen and rook, but Black can bring a third piece to bear on the kingside, with deadly effect. 46...Nd5! 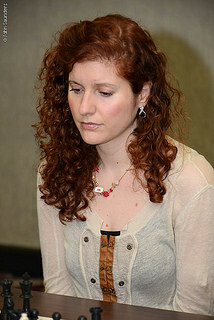 47.Qd2 47.exd5 Bxd5+ 48.Kg1 Qf3 wins. 47...Nf4+ 48.Kf2 48.Kg1 Nh3+ 49.Kh1 Nf2+ 50.Kg1 Qf3 wins. 48...Ne2+ 0-1 49.Ke1 Nxd4 soon wins. This game, by a genuine Cambridge undergraduate, had a delicious finish. Black is a comfortable pawn up and now finds a clever tactical justification for snatching a second one. 24...Nxf4! 25.g3 Rd4!! 26.Bb7 If 26.Qxd4 Ne2+ 27.Kh1 Nxd4 28.Rxf6 Kxf6 and Black emerges with his two extra pawns intact, and actually a useful positional plus to boot. 26.Rxf4 Qxe5 also leaves Black with a comfortable +2 advantage. 26...Qxe5! 27.gxf4 27.Bxc8 Rd1+! wins, much as in the game. If 28.Kf2 Nh3+ 29.Kg2 Qxb2+ 30.Rxb2 Rg1 mate. 27...Rd1+! 28.Kf2 Rc2+! 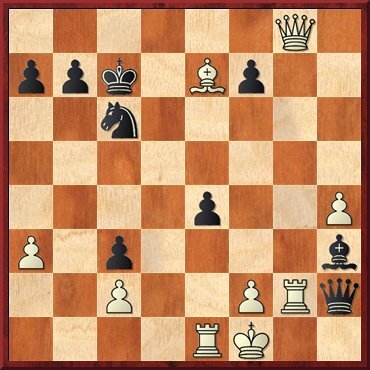 0‑1 Not the only winning move but the most aesthetically pleasing (having previously put the other rook en prise to the queen). 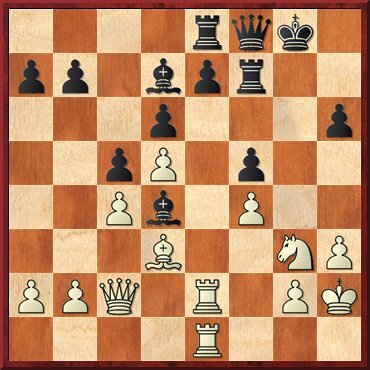 The idea is to break the pin and deliver mate, thus 29.Qxc2 Qe1+ 30.Kg2 Qg1 mate. Oxford scored a useful 5-3 victory over Barbican 2. The board seven game was rather fun, and a good way to finish this rather long report. 1.e4 d6 2.d4 Nf6 3.Nc3 e5 4.Nf3 Nbd7 5.Bc4 Be7 6.0‑0 Nb6 To give you an idea of how respectable this line of Philidor’s Defence is, the game Carlsen-Caruana from the 2014 World Rapidplay Championship reached this position before diverging with 6...exd4, etc. 7.Be2 exd4 8.Nxd4 0‑0 9.a4 a5 10.f4 d5!? A new move and maybe not bad, though it needs to be followed up with care as the white e and f-pawns are menacing marching up the board together. 11.e5 Ne4 12.f5 Nxc3 12...Bc5!? 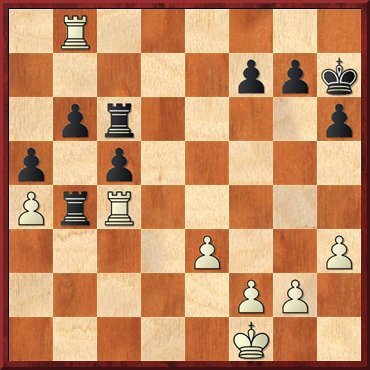 looks interesting, though White still might plunge on with 13.f6 g6 14.Kh1 Re8 15.Bf4, etc. 13.bxc3 c5 13...f6 14.e6 14.f6! A good, old-fashioned attack on the king, and very hard to defend. 14...gxf6 Loses quickly. So Black probably has to play 14...cxd4 15.fxe7 Qxe7 16.cxd4 though that too looks promising for White as he’s threatening Ba3, and maybe a rook lift and an assault on the king. 15.Bd3! 15.exf6 first also seems to win. 15...fxe5 15...cxd4 16.Qh5 f5 17.Rxf5! soon leads to mate. 16.Bxh7+! Our old friend, the Greek gift. 16...Kxh7 17.Qh5+ Kg8 18.Rf3 18.Nf5 Bxf5 19.Rxf5 Qd6 20.Rf3 wins the queen a bit quicker but comes to the same thing. 18...Bh4 19.Nf5 Bxf5 20.Rxf5 1-0 There’s no mate as such but only a masochist would want to prolong the agony with 20...Qd6 21.Qxh4 f6 22.Qh5 Rf7 23.Bh6 Qe7 24.Raf1 Nd7 25.R1f3, etc, etc. Division 1a: 1 White Rose 4(10½), 2 Barbican 1 4(10), 3 Blackthorne Russia 2(9½), 4 Guildford 2 2(8½), 5 Wood Green HK 2(8), 6 The ADs 2(7½), 7 Warwickshire Select 0(6½), 8 South Wales Dragons 0(3½). Division 1b: 1 Guildford 1 4(13), 2 Cambridge University 4(10), 3 Cheddleton 4(9), 4 Grantham Sharks 2(8½), 5 Oxford 2(8½), 6 Barbican 2 0(6), 7 e2e4.org.uk 0(5), 8 Hackney 0(4). Division 2a: 1 Cambridge University 2 4(12½), 2 3Cs 4(11½), 3 Anglian Avengers 2(7), 4 Rhyfelwyr Essyllwg 2(7), 5 Brown Jack Witney 2(6½), 6 Sussex Martlets 2(6½), 7 Guildford 3 0(7), 8 KJCA Kings 0(6). Division 2b: 1 Barbican Youth 4(10), 2 Spirit of Atticus 4(9½), 3 White Rose 2 2(8½), 4 MK Phoenix 2(8), 5 BCM Dragons 2(7½), 6 Grantham Sharks 2 1(7½), 7 Wessex 1(7), 8 Kings Head 0(6).